Tis the season for pies, tarts, and baked goods! With the holidays just around the corner, I decided to start baking again. 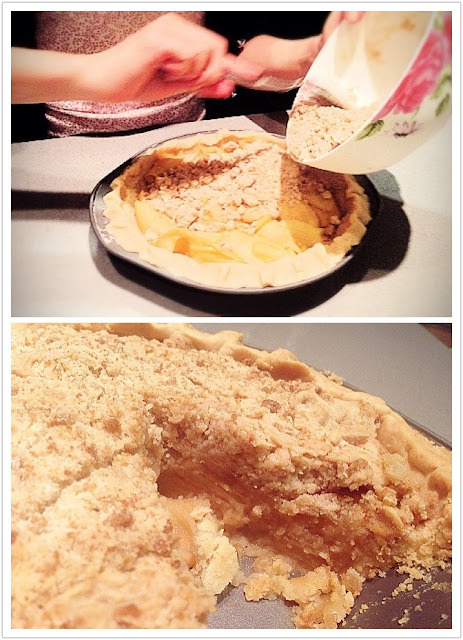 I typically enjoy snacking on light, crispy, fruity desserts, and Dutch Apple Pie was the first thing that came to mind~ a pie and crumble hybrid. The crust came out flakey and crispy, while the tart apples melded with the sweet crumbly topping. My favorite part about baking is your apartment will linger with a warm lovely scent for hours. The recipe is simple and delicious…perfect for dessert, breakfast, or a mid day snack. aww nic i can imagine you as a mummy warming up your house with the smell of apple pie for your little kiddies. i really love the way you write btw! thanks qinn! :):) I wish you were here so we could make pineapple tarts with golden flakes and cook dinner together! yet to try nicoles bakingggggg!